Trump UK visit: who really sold the US embassy? 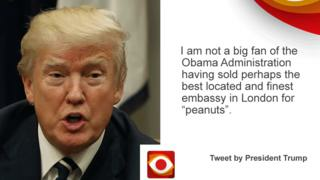 The claim: The Obama administration sold the US embassy in London for "peanuts". The verdict: President Trump is right that the sale did take place during the Obama administration. The final amount was not disclosed but estimates of its value varied between £300m and £500m. However, the decision to move was taken when George W Bush was in the White House. President Trump took to Twitter to announce he had cancelled a trip to the UK where he was expected to open the new US embassy building in London. He said it was because his predecessor Barack Obama sold the old building for "peanuts". The US mission is moving to its new diplomatic headquarters in south London after decades in the site at Grosvenor Square. The US government sold the lease for the old embassy to Qatari real estate group Qatari Diar, which plans to turn the building into a hotel. So, was President Trump right about which president sanctioned the sale? The building itself was never owned outright by the United States. It owned a 999-year leasehold, but the freehold is owned by Grosvenor Estates. The decision to move away from the Grade II listed building to Nine Elms was taken by the George W Bush administration in October 2008, shortly before he left office. The state department said it would begin construction on a new site in Nine Elms and the existing embassy was put up for sale immediately. It said it considered renovating the existing building but said the goal of moving to a secure, modern and environmentally sustainable site could best be met by moving. Reports that the sale of the old building had been completed appeared in November 2009, under the Obama administration. So President Trump is correct in that sense. It was reported in the Financial Times on 21 January 2009 that another Qatari firm had emerged as favourites to buy the building - a day after President Obama's inauguration - which means any final deal was agreed when he was in power. Was it sold for "peanuts"? It depends what you call peanuts. The final fee was not disclosed, but before negotiations began, the building was thought to be worth between £300m and £500m. The building was designed by modernist architect Eero Saarinen and completed in 1957. It was given Grade II listed status because of its special facade, which means the building's design cannot be altered. There was a suggestion that had reduced the value, which, according to the Guardian, might have reached £500m.